Sorry this is late and I haven't been posting hardly at all lately! Thanksgiving is over now, so there is no excuse! The last kimono event I was involved in was the All Souls Procession, a Tucson tradition for 27 years. As you probably have read before, my taiko group processes each year with a drum behind the urn- we are one of the Spirit Groups and bring in the Japanese tradition of "Bon Odori Festival" into the this event and we even have our own Obon dance called Tucson Ondo we do in the procession. This year, we also sang an Ainu chant during the procession about a wolf running after a deer in the woods. It sounded very Native-American. Since the theme of the procession was "the Hunter and the Hunted", we decided on using a kitsune (fox) image for make-up or as a costume element I found a fabulous DYI fox mask on wintercroft.com, folded it, painted it and put it on my Japanese hat. The Wintercroft fox mask. I used cards-stock since that's what I already had. The painted mask affixed to the hat. I used millinery netting around the hat to hold photos. Haiku by Issa Kobayashi was used on the photos and the items I placed in the urn. I coordinated the hat with a dance yukata and wonderful red hakata obi. I'm wearing tabi sox and regular flip-flops in the photo since I hadn't changed into my jika tabi yet. The red stuff on the sides of my head (under the hat) is leftover from another hat project- it's wired chenille, kind of like huge pipe cleaners. It was in case it became windy and I needed to tie the hat onto my head! Plus it was soft and furry and looked really cool. Here is the crowd waiting for the procession to start- the big metal polygon is actually the urn. It is pulled along the procession route and then hoisted in the air on a crane at the end of the ritual and lit on fire. It is filled with combustible items: prayers hastily written on paper, memorial items including ashes of loved ones, photos, bits of cloth, poems, pet toys, drawings, wishes and dreams. You can see our taiko on the cart behind it. Right in the center, you can see a figure with a long blond wig. That is our taiko group's creative director about to do Ondeko or Demon Drum Dance. We had a black demon and a white/red demon do the dance to launch the procession and at the end of the procession. A very fierce White Demon! The Demons dancing at the Columbarium. This is the end point of the procession. This is where the urn waits until it moves onto the stage to complete the ritual. Spirit Groups, musicians, dancers, acrobats, color and projected video and take the stage while musical guest artist SORNE provided a moving and mystical soundscape. Crane taking the urn up. The urn being lit on fire. The urn is hoisted on the crane, set on fire and then burns. SORNE continues while the event winds down. This was a very special procession this year since a new friend of mine came with me and experienced the event for the first time. I taught her the Tucson Ondo dance, the Ainu chant, and loaned her a happi coat to wear so she would fit in with our group. She carried a photo of her mom with her. She said the event was very moving and respectful and the music was beautiful. I also celebrated the lives of four people I will miss: my brother and three of my friends. Some of my brother's ashes went into the urn. I think he enjoyed the show. 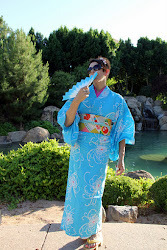 The Tucson Japanese Festival is Coming!